Mike Sparks is a versatile performer and writer based in Barnet. 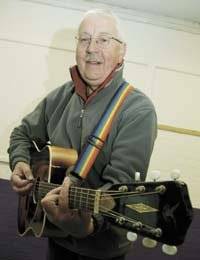 As a singer/songwriter, Mike has been around folk clubs in North London for more years than he cares to remember. He is a resident singer and booking organiser at the well known Herga Folk Club and regularly performs at other venues. Mike's song writing career began in the late 1980s since when a number of his songs have passed into the hands of others such as the late Johnny Collins; Graeme Knights; Lynne Heraud and Pat Turner; Tom and Barbara Brown and Tom Lewis. His songs are regularly heard in Club and Festival singarounds across the country and in places as distant as Holland and the USA. The recordings page has details of Mike's CDs. More recently Mike is a founder member of Barnet Hill Lifeboat Crew who perform shanties and sea songs for charity. Mike is also a published playwright whose modern interpretations of Holy Week Mystery Plays are regularly toured around Churches in North London and have been performed across the country as well as in Eire and Spain. Mike's plays are available from LazyBee Scripts who also publish Mike's other written works. Mike also presents Singing Sydney – the work of Sydney Carter, and has now also written a presentation entitled The Glorious Madness which provides a different view of the Great War of 1914-1918 and which features songs written and performed by Les Sullivan. Details of both presentations and how to book them can be found on the gigs page.